Rogue Valley Farm to School has arrangements with four local farms that serve as educational farm sites. Each site is a working farm that opens its gates for local students to experience hands-on farm education. Farm sites are located throughout the Rogue Valley to allow easy access for the school districts in each region. Each farm site has outdoor kitchen facilities for Harvest Meals. We’re thankful to partner with such great farms! 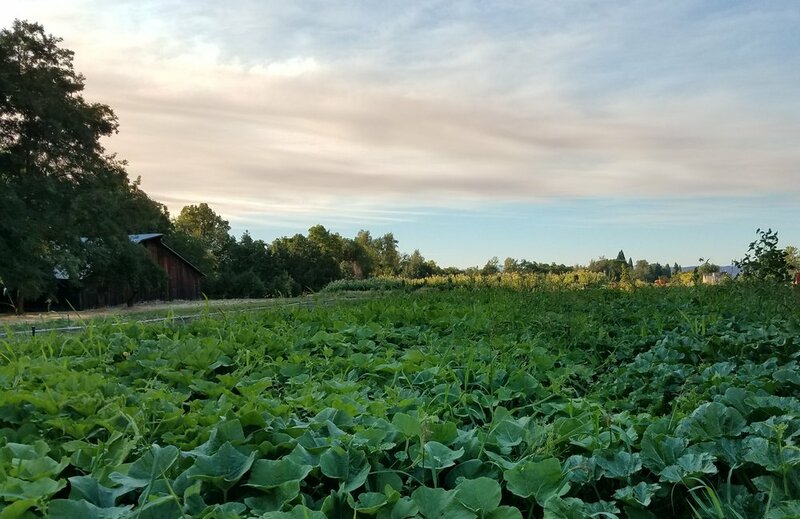 The Farm at SOU is a living learning laboratory featuring a diverse vegetable farm on land adjacent to many pre-school, elementary, middle and high schools. The Farm has been hosting RVF2S Harvest Meals and other programs since 2014. Historic Hanley Farm, established in 1857, is a 37 acre working farm. Owned and operated by the Southern Oregon Historical Society, Hanley Farm strives to preserve the history of the people who settled the land and their contributions to the agricultural development of the Rogue Valley. Hanley Farm is the home base for the Family Nurturing Center Farm & Food Program, where families participate in therapeutic groups as they grow, harvest, prepare, and preserve healthy produce, eggs, and meat raised using sustainable methods. Wandering Roots Farm is a 50 acre certified Organic fruit and vegetable farm located between Gold Hill and Rogue River. Started by Jeff and Anna Boesch in 2012, Wandering Roots Farm is a diverse operation with 8 acres of mixed vegetables, 1 acre of mixed berries, over 2 acres of mixed fruit and nut trees, and 20 acres of pasture. Wandering Roots Farm sells their produce at several farmers markets, grocery stores, and local restaurants throughout the valley. White Oak Farm & Education Center is dedicated to cultivating connections between people and their local ecosystems by pursuing community food security, fostering agricultural and ecological diversity, and teaching the arts of sustainable living. White Oak Farm grows fruits and vegetables using principles of permaculture and integrate animal husbandry into their production systems. The Crest at Willow-Witt is an educational organization on the 445 acre Willow-Witt Ranch in Southern Oregon. This beautiful home consists of forest, wetland, and an organic farm with vegetables, goats, chickens, and geese. They cultivate connection between people and sources of food, forest and water for all ages.